Positive Detroit: Tickets for BravoBravo! On Sale Now! Tickets for BravoBravo! On Sale Now! Tickets for this year's BravoBravo! fundraiser, supporting Michigan Opera Theatre and the Detroit Opera House, will go on sale tomorrow, April 1, 2010. In its 11th year, BravoBravo!, presented by Bank of America, will take place on Friday, June 4, 2010 from 7:30 p.m. to 12:30 a.m. at the Detroit Opera House, 1526 Broadway, in Detroit. Tickets cost $85 during the month of April. 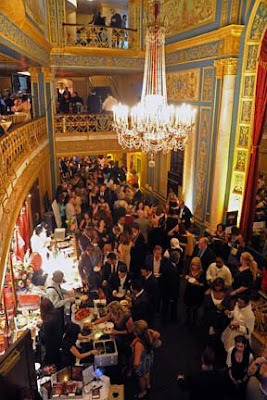 The event, coordinated by the young professionals group of the Michigan Opera Theatre Volunteer Association (MOTVA) brings together the city's top restaurants, showcases its best live musical acts and draws thousands of revelers all in support of Michigan Opera Theatre (MOT). This year's event is co-chaired by three of Detroit's most involved young professionals: Jerrid Mooney, Jen Knapp, and Rich Rice. Fashionistas take note: BravoBravo! spans the globe this season, transporting high fashion straight from the runways into the elegant rooms inside the Detroit Opera House. BravoBravo! supports the continued success and daily operation of Michigan Opera Theatre. In 2009, BravoBravo! drew a record crowd of over 2,000 young professionals and raised over $180,000 to support MOT. For 2010, organizers aim for a goal of $250,000 to support MOT's artistic and educational programs. Since its inception, BravoBravo! has raised more than $800,000 and is considered a critical fundraising effort for Michigan Opera Theatre. Tickets can be purchased at the Detroit Opera House box office, by phone at (313) 237-SING, or online at www.bravobravo.org. The event is expected to sell out. BravoBravo! attendees must be 21 or older.